A good nose contour can easily make it seem that you have had a nose job! There are lots of tutorials all over the internet that claim the perfect nose contour with a dozen tools, and tips that leave your more confused rather than make your task easy. An easy and good nose contour takes just three steps and only three products! It is not a science experiment, and with practice you will become a pro at it. First apply your foundation and concealer, and then begin your nose contour. Your will need a luminous concealer, a sculpting or contour powder, and a blending brush. Take a luminous concealer, avoid using a shimmery one or any that contains shimmer particles, and start from the bridge of your nose. Bring it down your nose, stop, leave a small spot and finally apply a little dot at the top. Brightening concealers work best, a shade that is lighter than your skin tone, rather than highlighters for this step. Luminous concealers give a radiant glow that we aim for in this step rather than a strip of sharpness. Use your fingers or a Beauty Blender to soften the application of the luminous concealer and rub of any harsh edges or lines. Use a contour or sculpting powder, one shade darker than your natural skin tone, and apply it with a soft blending brush. 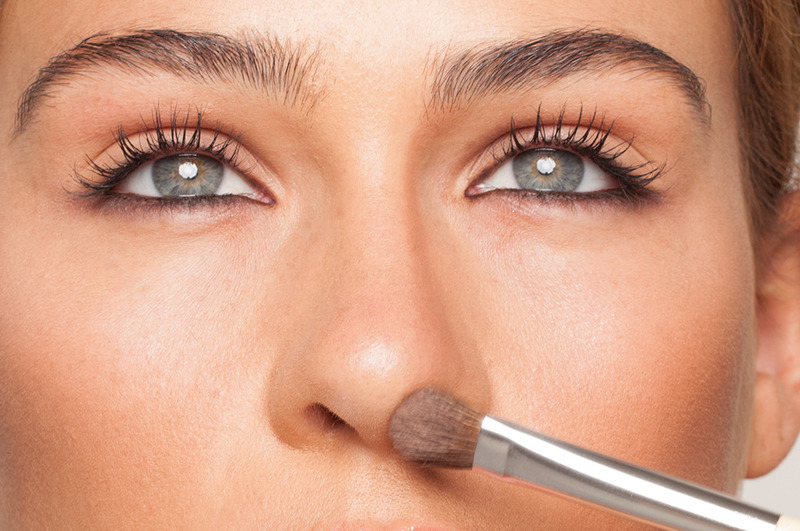 Tap off excess powder and start from the inner corner of your eye, and bright it right down your nose. Do both sides of the nose, and blend perfectly for a contour that is natural and not harsh.